Did you that know a simple swab of your cheek can reveal where your genetic ancestors came from thousands of years ago? Sitting inside your mouth is data that can provide insight into who you are and where you’re from. Thanks to Living DNA’s ancestry test, I found answers and discovered more about my past and genetic heritage than I ever thought possible. You can too! And it’s more affordable and easier than you may think. Read on to learn how you can start digging deeper into your family history with our Living DNA ancestry review. Given our in-depth research and individual insights from testing the kit ourselves, we put together the following Living DNA review. 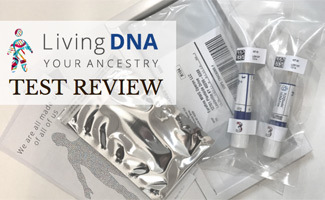 Although they didn’t make our top three in our DNA Ancestry Test comparison review (due to being so new to the game and more focused on the U.K. market), they are still worth considering. We will continue to keep an eye on them as they grow. Lab is located in the UK, which doesn’t hold the same certification standards as in the U.S. Living DNA occasionally has time-sensitive coupons. To celebrate DNA Day get $40 off DNA tests - only $59 (regularly $99) now through 4/27/2019. Use this link to save (no code needed). We were given a Living DNA test kit in exchange for an honest review. As industry experts in Ancestry DNA, we felt the need to try the DNA kit ourselves so that we would have a better understanding of the process. You should know, while each person’s DNA is unique to them, the process of collecting your DNA and buying the kit is the same for everyone. Read more about how it works in our DNA 101 article. As soon as the results are in, you’ll receive an email notification. To access it, log in to your online portal (they do not mail them for privacy reasons). (Note: If you order a printed book you’ll receive that another 3-4 weeks after the online test becomes available.) Click on your test to see the break down of results by family line, motherline and fatherline (if you’re a male). 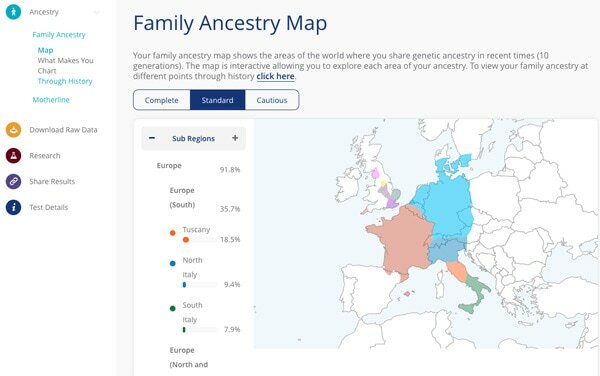 Your family line has a map which shows areas of the world where your genetic ancestry is located (see below). You can then visualize the data in different ways including a chart and thorough history (to see your family’s potential migration routes). The motherline results assign you a Haplogroup and a Subclade and break down your mtDNA into geographic regions. They even provide a unique URL which you can then share with your family and loved ones. Are Customers Happy With Living DNA Ancestry? As part of our in-depth review process, we scour the web for consumer feedback about each company we write about. Below you’ll see a sampling of both positive and negative opinions we found from other customers about Living DNA to give you an idea beyond our own experience. Learn more about the people behind Living DNA and gain a deeper understanding of how their product can tell you more about your past in this short video. Also, check out this article in the U.K.’s Daily Express that takes a closer look at the background of Living DNA and their founder’s passion for DNA testing. Is Living DNA Worth It? If you have relatives from the U.K. or want to explore more of your British heritage, look no further than Living DNA. This DNA ancestry test specializes its research in the British Isles and has a detailed breakdown of those regions. In our personal experience with the kit, we were very pleased with everything from the ease of sample collection right through to the high-quality of the analysis and information provided with the results. The turnaround time and pricing is on par with other DNA ancestry tests, and for the value of three tests in one (or two if you are female), it’s a great deal. While they don’t have family matching yet, it’s only a matter of time before they add that service. And since they are a relatively newer company they are constantly adding new people to their database to beef up their analysis capabilities. Give Living DNA a shot – we don’t think you’ll be disappointed! Have you considered doing a DNA ancestry test. Why or why not? I just got my LivingDNA test results back! It took awhile but worth the wait. Super easy to understand the results and love how they map it out and color code it. Makes understanding the data much less overwhelming and easy to digest. I would have appreciated it if you had attempted to contact me and ask my permission to use my comment for your review (I am the user sktibo on anthrogenica, which you have spelled as “sktbo”) That comment was written well before the complete mode was released and it is now outdated and no longer entirely true. I would be more than happy to provide my updated commentary on this test for your review here if you will contact me and ask me for that. Spencer, thanks for reaching out and sorry to hear your review is outdated! Will email you to get an updated review that we can use with your permission. Thanks Spencer for sharing your experience with us!